Did you know that there's now more plastic and trash in the ocean than there are fish? This is a huge and ever-growing problem. While banning single-use plastic bags and other needless waste is a nice start, it’s not enough to save our oceans and other ecosystems. We can’t fix the plastic problem overnight, but there is more we must do than rely on Starbucks and Walt Disney World banning plastic straws and a few places banning grocery bags. It’s a great step for such influential companies and cities to ban these products, but we can’t stop there. There’s so much more to the plastic floating in our waterways than just bags and straws. Hopefully this wave of plastic bans is just the beginning of greater changes in the near future. Let’s take a look at what more needs to be done on top of simply banning the use of those little plastic straws. Consumers began using plastic for a number of products around the end of the 19th century, when celluloid was invented. Between 1960 and 1970, single-use plastic items such as straws and shopping bags were not only becoming cheaper to make, but they were also more convenient than their paper counterparts. Plastic is lightweight, durable, and waterproof. Paper is much more likely to get soggy and/or tear. Along with the plastic that’s used to make items like computers, phones, cars, toys, and other technology, it’s also used to wrap most of our products for protection. It helps keep our food fresh on the shelf and transport fragile items to the store in one piece. However, once you fast-forward to today, it’s easy to see that our convenience with plastic has created a large inconvenience for our environment. Tons of plastic waste washes into landfills and the ocean daily. The American Association for the Advancement of Science estimates that around 4.8 - 12.5 million tons of plastic are added to the ocean along every foot of coastline in the world per year. It’s estimated that there are around 175 million plastic straws used every single day around the world. These straws do not biodegrade. In fact, the plastic waste that flows into the environment and washes into our waterways will remain there for the foreseeable future. What a way for us to leave our footprint on this Earth. Another problem that we’re only beginning to research is how plastics break down. 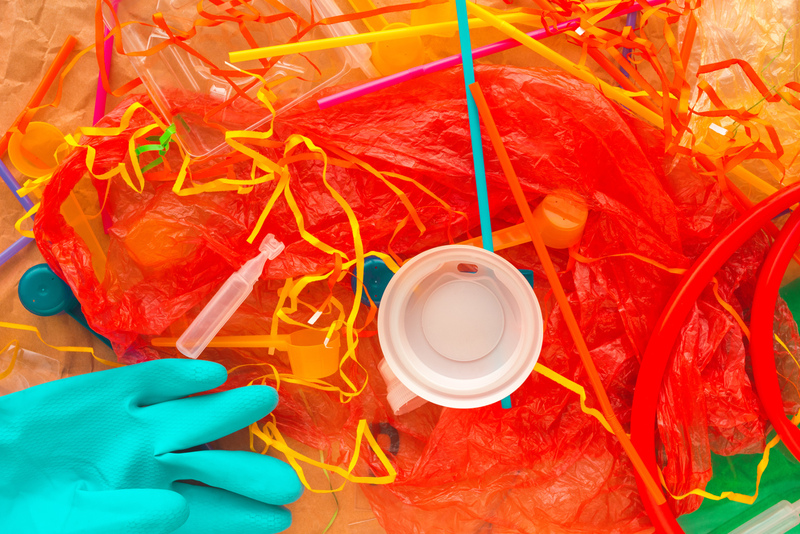 While larger plastics do degrade over time (they’re not completely invulnerable to wear and tear), they simply break into smaller pieces of plastic and eventually into microscopic pieces known as micro-plastics. These plastics are potentially carcinogenic and over time will attract other harmful pollutants. These micro-plastics stick around and are getting everywhere, including our drinking water and food. This problem might even be scarier than the large piles of trash, since it’s harder to track and clean up, and we don’t know the extent of the health problems that might arise from consuming so much plastic. If we as consumers are going to take on the issue of using less plastic, why is the current focus on something as small as the straw? Why not start with the plastic that covers almost every item at the store? The straw is just a small part of the problem. The advocates for the ‘say no to straws’ movement say that a major purpose is to raise awareness for the overuse of all plastics. That banning straws is a small step in a larger direction. Compared with our other daily plastic use, avoiding straws in your iced coffee or water is a relatively easy habit to break on the consumer's side. The hope behind banning single-use plastic straws is that it will grow into a larger awareness of all the other single-use items we’re tossing away. While straws aren’t the biggest concern for our oceans, it is a manageable change for those who want to make a difference. Will Saying No to Plastic Bags and Straws Really Make a Difference? If we don’t lose momentum on the movement to reduce plastic waste, these small steps can turn into a multitude of improvements. That reusable straw you carry around could go into a cool new stainless steel water bottle. You could bring canvas bags to the grocery store and reusable containers for restaurant leftovers. Every time you choose a reusable solution, less plastic is ending up in the environment. And while you’re working on saving the world one plastic bag at a time, the people around you are watching and they might start doing the same thing. Your small impact can and will slowly make a difference. Although much more is needed to start really reducing the use of plastic that ends up in our ocean, you have a choice to go out and start making that change. Call your elected officials and ask them what they’re doing to help reduce the use of plastic in your state and community. Tell others around you why you use that water bottle and canvas grocery bag. This is a global problem that needs more attention, and we can’t be content to leave it at banning straws and plastic bags. So no, maybe these bans are not the answer to our plastic problems, but it’s a start that’s getting people thinking and talking about the issue. After people get used to the straw bans, more can follow. Once people feel more obligated to stop using so much plastic in our everyday lives, we can put more pressure on the companies who wrap everything in plastic for us. Let’s let the ocean fill back up with wildlife, not plastic. Learn more about ocean conservation from Ranger Mac!